Federal regulatory agencies consume enormous amounts of time and resources in producing approximately 3,000 final regulations each year. Agencies have seen sizable increases in their budgets in the last several years, as they have added thousands of new rules and requirements to the books. Unfortunately, the evidence suggests that these increases have not necessarily meant resources have been used well. 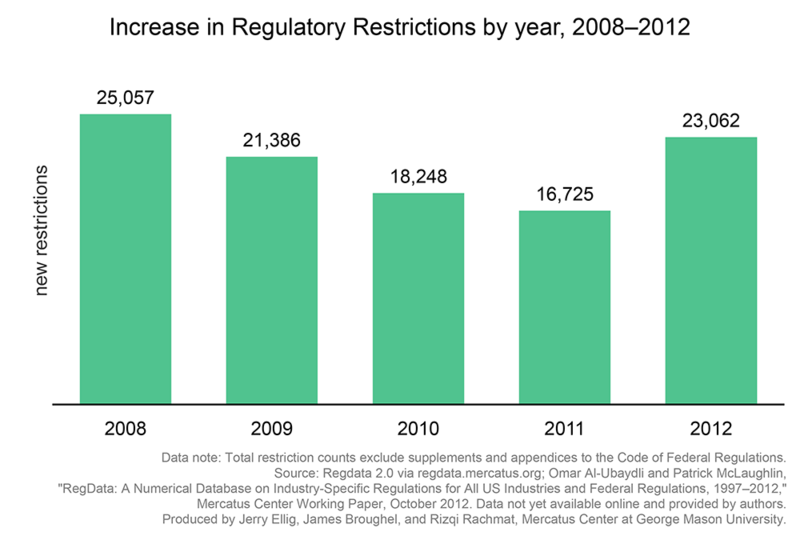 As the chart below demonstrates, 104,478 new regulatory restrictions were added to the Code of Federal Regulations (CFR) between 2008 and 2012. At the same time, more than 18,000 regulations were finalized. Regulatory restrictions are words that signify a binding constraint that restricts behavior. These are words like “must,” “shall,” or “may not” that appear in regulatory text. In 2012 alone, agencies added over 23,000 restrictions to the CFR.